So I lied. I was planning on making homemade french fries with tonight’s meal but when I pulled out the potatoes I had a new idea. Of course I couldn’t decide whether I wanted garlic Parmesan or Old Bay seasoning on them, so I decided to make both. 1. Wash off the potatoes and cut into thin slices. 2. Fill a medium sized bowl with cold water and soak the potato slices for 20-30 minutes. 3. Drain the water and pat the potatoes dry with a paper towel. 4. Preheat the oven to 425. Line two baking sheets with aluminum foil. 5. Arrange the potato slices in single layers on the baking sheet. 6. Brush both sides of the potatoes with the olive oil. 7. Sprinkle the Parmesan cheese, garlic powder and pepper over the potato slices. 8. 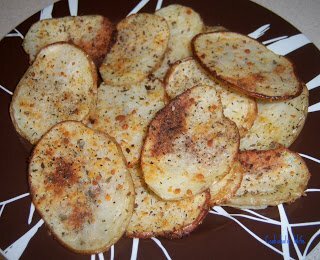 Baking for 15-20 minutes or until the potatoes are slightly browned and crunchy.